675W Equiv, 4x Umbrella,3x Backdrop,5x Stand,US FAST!! 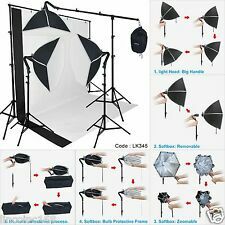 3 Photograpy Softbox Boom Stand Photo Studio Video Continuous Lighting Photo Kit. This is Easy To Work With And Will Give You Professional Images With Every Shot.. 24" x 24" Softbox with Light Socket. Click for Full Description. 1 x Linco#BLK0510T Linco 5'x10' Black Backdrop Screen. 1 x Linco#WH0510T Linco 5'x10' White Backdrop Screen. 1 x Linco#GE0510T Linco 5'x10' Green Backdrop Screen. 2 x Linco#4216-1 Linco#4216-1 Backdrop Holders. This professional soft white reflective umbrella which is suitable for all studion flash is easy to use and assemble. 1 x 45W 110V 5500K Photo Light Fluorescent Bulbs. Continuous Lighting Set. Works alone or works with umbrella. 3 x Linco#3402-3 Pheno 24" Golden Square Softbox Reflector Umbrella. ID: Linco#3402-3 Pheno 24" Golden Square Softbox Reflector Umbrella Qty: 3. Multi-functions: Reflector, Softbox, Umbrella. 3 x Linco#PP171050-1 High RA 6400K Fluorescent Bulb. 3 x Linco#3402-2 Pheno 24" Silver Square Softbox Reflector Umbrella. ID: Linco#3402-2 Pheno 24" Silver Square Softbox Reflector Umbrella Qty: 3. Multi-functions: Reflector, Softbox, Umbrella. 5 x Linco#4228-1 Backdrop Holders (Backdrop Helper). Dimmable LED Light. ELEGANT COLOR AND DESIGN: Designed with White color which looks more elegant. Widely applied to portrait, makeup, youtube videos, studio shoot, video blogging, portrait photography and live streaming etc. TypePhotography Umbrella Kit. ModelSoft Umbrella Photo Studio Kit. Lusana Studio Continuous Lighting Umbrella Photography Stand Light. Umbrella Size33". - Works with most of Flash/Strobe Light, Umbrella, Reflectors. Made of high quality material, it is durable and sturdy for you to use. It is easy to collect all the accessories and can be taken outside conveniently. How can you miss it any more?. Ultimate soften light stream and remove shadow to make perfect shooting. Linco Inc. introduces the Morning Glory, a multifunctional reflector, softbox and snoot used for single light holders. It includes highly reflective silver interior lining to achieve a high light efficiency. 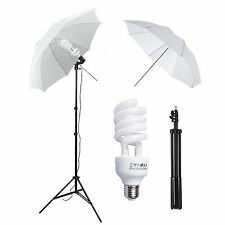 Photo Studio Photography Kit 3 Light Bulb Umbrella Muslin 3 Backdrop Stand Set What is Included? 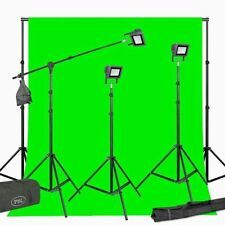 (2) White Premium Umbrella Reflector (1) Black/Gold Premium Umbrella Reflector (3) Single Fluorescent Light Holder (3) 7ft Tall Alumiumt Light Stand (3) Day-Light Studio Light Bulb (1) 5'x10' White Backdrop Screen (1) 5'x10' Green Backdrop Screen (1) 5'x10' Black Backdrop Screen (1) Backdrop Support System Stand (4) Backdrop Clamps (1) Carry Bag Item color may slightly differ from photos due to varying monitor display and settings. Photo Studio Photography Kit 3 Light Bulb Umbrella Muslin 3 Backdrop Stand Set Package Contents： (2) White Premium Umbrella Reflector (1) Black/Gold Premium Umbrella Reflector (3) Single Fluorescent Light Holder (3) 7ft Tall Alumiumt Light Stand (3) Day-Light Studio Light Bulb (1) 5'x10' White Backdrop Screen (1) 5'x10' Green Backdrop Screen (1) 5'x10' Black Backdrop Screen (1) Backdrop Support System Stand (4) Backdrop Clamps (1) Carry Bag Item color may slightly differ from photos due to varying monitor display and settings. 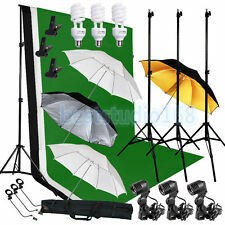 Emart Professional Umbrella Continuous Lighting Kit is specialized in providing premium light. So Emart Professional Umbrella Continuous Lighting Kit will give you great photo which you want. 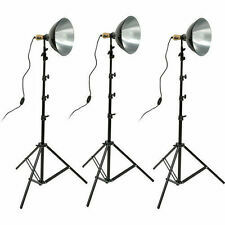 Complete Photo Studio Lighting kit for Portrait Photography or Shooting Video. Neewer 600W Umbrella Continuous Lighting Kit for Product,Portrait Photography. Color Temperature: 5500K. This professional kit is perfect for advertising products, photo-art, industrial, scientific and technical photography, photographic reproduction. 5 x Linco#4228-1 Backdrop Holders (Backdrop Helper). 1 x Linco#ge0510t Linco 5'x10' Green Backdrop Screen. 1 x Linco#wh0510t Linco 5'x10' White Backdrop Screen. 1 x Linco#blk0510t Linco 5'x10' Black Backdrop Screen. The Arri Compact Fresnel Three-Light Kit is based on three of the most popular tungsten Fresnel fixtures on the market--the Arri 150W, 300W Plus and 650W. This is a full lighting kit, including bulbs, scrims, barndoors, light stands, and a hard wheeled carrying case. Photography Photo Studio 33" Soft Umbrella Continuous Lightning Light Stand Kit Package Contents： (2) High Quality Light Stands (1) Miniature Light Stand (3) Professional Series Light Holders (2) High quality 33" Soft umbrellas (3) Compact Fluorescent Daylight Bulbs 45 W 6500K (1) Carrying Case for the Kit. 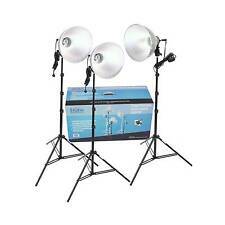 Photo Studio Photography Lighting Kit Umbrella Light Stand Backdrop Stand Set. Photography Backdrop Support Backdrop Stand Backdrop Stand Dia: 1". Backdrop Holders: Nylon Rubber. 1x Backdrop Stand Kit. Condition is New. USB POWERED LED LIGHT: The USB port works with multiple devices. 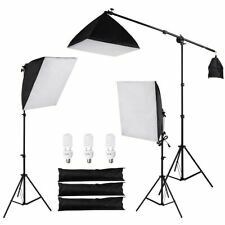 The best worthy price for this photography studio kit lighting system photography Tutorial videos make a huge difference to your Photo/videos The best worthy price for this photography studio kitFeatures: ※ Works well to diffuse the light from any Flash/Strobe Light and Constant Light. Save Electricity! 45 watts Energy Saving Compact Fluorescent Spiral Bulb. 2 x 7 feet Light Tripod Stands - Works with most of Flash/Strobe Light, Umbrella, Reflectors. Height of Tripod : Min 3 1/2ft - Max 7ft. The 2 4 x2 4 "/60x60cm round photo studio light tent can eliminate glare and spots. Soften and reflect lights for a perfect shot. (1)2 4 x2 4 "/60x60cm Round Photo Studio Light Folding Tent (4)Colored Internal Backgrounds(Black White Red Blue). Photography Video Screen Backdrops Light Stand w/ 3 Soft Umbrellas Lighting Kit Package Contents： (2) White Premium Umbrella Reflector (1) Black/Gold Premium Umbrella Reflector (3) Single Fluorescent Light Holder (3) 7ft Tall Alumiumt Light Stand (3) Day-Light Studio Light Bulb (1) 5'x10' White Backdrop Screen (1) 5'x10' Green Backdrop Screen (1) 5'x10' Black Backdrop Screen (1) Backdrop Support System Stand (4) Backdrop Clamps (1) Carry Bag Item color may slightly differ from photos due to varying monitor display and settings. Material: Premium-quality Nylon Material Umbrella Efficiently Produces Evenly Spread. Single Head Photo Bulb Socket with Umbrella Holder. Energy saving compact fluorescent spiral bulb, it saves energy up to 80%. (1)The 33"/84cm black/silver umbrella softens all light sources while maximizing light spread, and reflects more light than a translucent umbrella or soft-box. (2)The single head light holder allows you to attach a bulb to a light stand and add an umbrella. 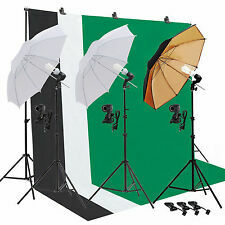 Photography Studio Backdrop Softbox Umbrella Lighting Kit Background Stand Set. 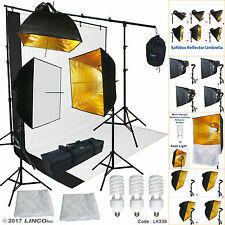 2250W Photo Studio Video Continuous Lighting Kit Photography Softbox Light Stand. Photog Studio Softbox 135W Boom Arm Soft Box Continuous Lighting Light Stand Kit. Bescor LED 3 Light Photo/Video Kit (Never Used!). Shipped with USPS Priority Mail. Three LED light boxes with 3 AC power supplies and three telescoping tripod stands. Excelvan 135W Studio Umbrella Softbox Continuous Lighting Kit -2x33" Umbrellas 3x5500K 45W Lamp Light Bulb with E27 Light Holder 80" Light Stand 32" Table Top Light Stand Portable Bag. Air Purifier. 50 70cm softbox with single bulb holder which is easy to dismount. 75-148cm adjustable cantilever stick to adjust the angle and standards of the softbox. Cantilever Stick Length: 1.48m / 58.3in(Max.). Excelvan 135W Studio Umbrella Softbox Continuous Lighting Kit -2x33" Umbrellas 3x5500K 45W Lamp Light Bulb with E27 Light Holder 80" Light Stand 32" Table Top Light Stand Portable Bag. 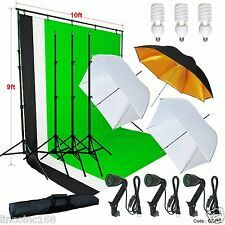 (2) x 33" Photography Studio Translucent Shoot Through White Photo Video Umbrella. 2 x 45W Light Bulbs. 2 x 33" White Umbrellas. 2 x 33" Silver Black Umbrellas. Watts: 45W. Ultimate soften light stream and remove shadow to make perfect shooting. Energy Saving Compact Fluorescent Spiral Bulb: Save Energy up to 80%. 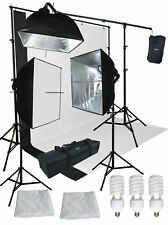 Photography Studio 135W Softbox Continuous Lighting Soft Box Light Stand Kit New. 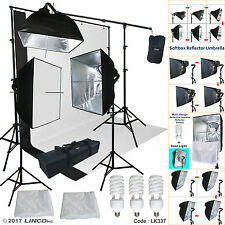 Photography Studio Backdrop Softbox Umbrella Lighting Kit Background Stand Set. 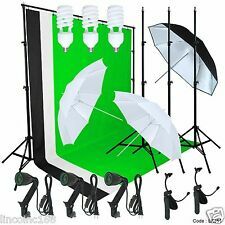 2250W Photo Studio Video Continuous Lighting Kit Photography Softbox Light Stand. We proudly stand behind the quality of our products. 65 Point Inspection. Why Choose Us?. 25 Years experience. Like NewFully Functional. As an industry leader in product sourcing and reconditioning, we are expert in providing the best and finest quality products. 22" x 22" Softbox with Light Socket. Softbox: High quality nylon, White, 22" x 22". 3 x Black Portable Oxford Bag for Softbox. Light boom arm stand for photo studio light weight. Compact reflector holder boom and stand kit. White diffuser can make soften the light source and enhance skin tone in portraits photography. Adjustable U mount bracket makes the light toward different angle for the best shooting. Features with color temperature knob, can adjust the color temperature from 3200K to 5600K. Fancierstudio Photography Studio Lighting kit Video Photo Portrait Light Kit with Muslin Backdrop Background Support Stand H57. Ideal for portraits, Studio, Photography, Video. 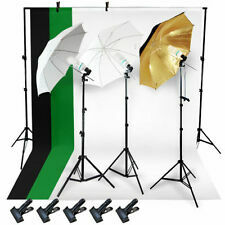 Premium ePhoto Video Photo 2 lighting Kit with background stand. Smith Victor K 77 lighting kit. CASE Model 765-SG 740 . PRO Quartz Lights w/Hard. Lights tested - BRIGHT. Kit was only used twice. PHOTOS SHOW ALL! 5 x Linco#4228-1 Backdrop Holders (Backdrop Helper). 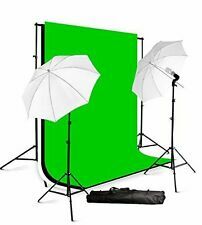 1 x Linco#GE0510T Linco 5'x10' Green Backdrop Screen. 2 x Linco ZENITH 77" Compact Backdrop Stand. 3 x Linco#3402-3 Pheno 24" Golden Square Softbox Reflector Umbrella. With a carry bag and a backdrop stand storage bag, convenient for you to carry about. Two 83cm studio shoot-through umbrella to reflect the light the the product. One double layers umbrella(black externally, golden internally) to minimize light loss and maximize light spread.